Edelman's annual study signals the growing importance of employee engagement and CEO activism, as employers are now more trusted than business, government, media or experts. 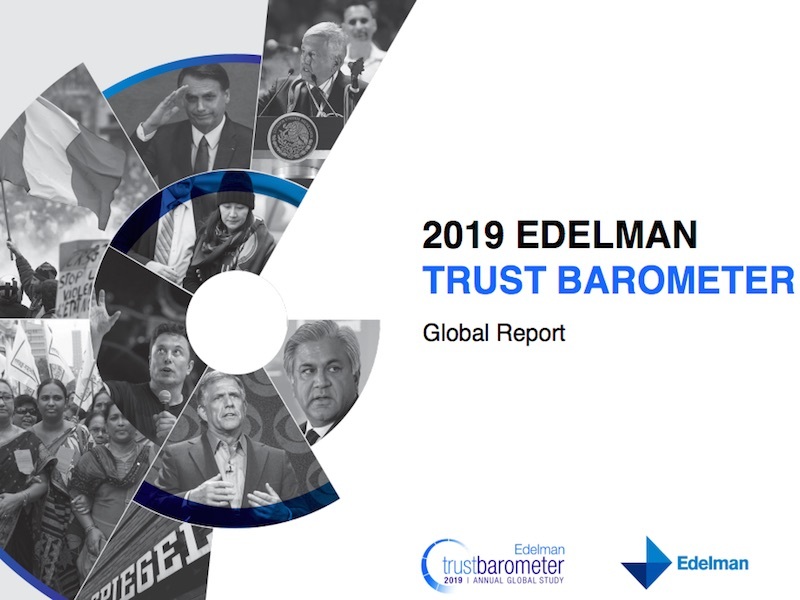 LONDON — Employers are now the most trusted institution, according to the 2019 Edelman Trust Barometer, with 75% of respondents saying they trust “my employer” – 25 points more than business in general, 40 points more than government, 20 points more than a peer or expert and 10 points above traditional media. Of the 33,000 people surveyed in 27 countries for the 19th annual Trust Barometer, more than three quarters (76%) say they want CEOs to take the lead on change instead of waiting for government. And 73% believe a company can take actions that both increase profits and improve economic and social conditions in the community where it operates. A similarly high number of employees expect their employer to actively join them in advocating for social issues (67%), and 71% expect that their work will shape the future of society in a meaningful way. Stephen Kehoe, Edelman’s global chair of reputation, told the Holmes Report: “We’ve seen a decline in trust across most institutions, so we decided to unpick what is it about the employer/employee relationship that appears to be working well from a trust perspective. “Overall, people are pessimistic about the future, and they are also concerned about fake news, and don’t trust the media and government, so 58% say they are looking to their employer as being a trustworthy source of information about headline issues where there is not consensus in society, such as gun control, #MeToo, or immigration. The survey finds that employers that work to build trust will reap the rewards: employees who trust their employer demonstrate greater advocacy (71%), loyalty (78%), engagement (74%) and commitment (81%) than employees who do not trust their employer. In his summing up of the survey, Edelman president and CEO Richard Edelman said the findings signalled a new contract between employer and employee he called "trust at work", and outlined a number of pointers for CEOs wanting to leverage this, including leading change and empowering employees. Elsewhere in the Trust Barometer, trust in traditional media and trust in search are now tied at 65%, the highest-ever level for search, with the biggest increases in developed markets. Conversely, after trust in social media plummeted last year, it remains low, at 44%. The gap between trust in traditional and social media is now at an all-time high of 20 points globally and as high as 35 points in some developed markets. There was, however, an unprecedented jump in people’s consumption and sharing of news and information, up 22 points to 72%. There was a huge spike in engagement in news from women in particular, which Edelman has called the #MeToo effect, as women appear to be increasingly sharing reports that resonate or make them feel empowered. The 2019 Trust Barometer also shows a return to the largest ever “trust gap” (16 points) between the “informed public” (65%) and the “mass population” (49%): in other words, those who regularly read business and political news trust the institutions covered in the survey far more than the wider public. The trust gap is also partly explained by the trust gap between the sexes outlined by Edelman Europe CEO Carol Potter: women are more skeptical of institutions and the gender trust gap is in the double digits in several developed markets, such as the US (15 points) and Germany (14 points), mostly driven by women’s lower trust in business.